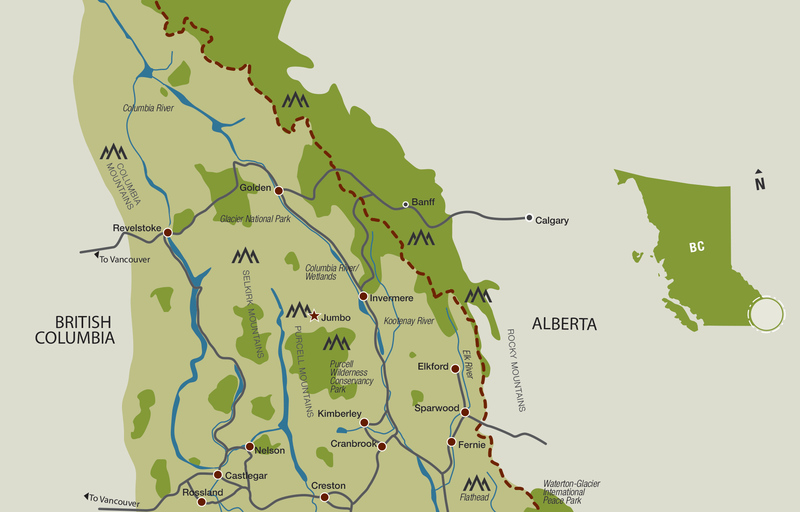 We live and work in one of North America’s most diverse, beautiful and wild regions—Canada’s Columbia and Southern Rocky Mountains. Our region is recognized globally as a critical component of North America’s most intact wildlife and wilderness corridor, running from Yellowstone in the south to the Yukon in the north. It is home to one of the most diverse and dense populations of large animals in North America. This region also includes the Columbia Wetlands—at 180 km long, they are one of the longest intact wetlands in North America and form part of the Columbia Headwaters, source of the mighty Columbia River. Along with its adjacent mountain ecosystems, the Columbia Headwaters provides source water to the Arctic, Pacific and Hudson Bay watersheds. Due to our region’s connected wild systems, its been rated by global scientists as providing one of the best opportunities on the planet for successfully addressing the impacts of climate change. Five local Wildsight branches work at the grassroots level to build a conservation ethic in our communities and a culture of sustainability. These autonomous branches are as diverse as the towns they’re located in: Creston, Elk Valley (Fernie), Golden, Invermere and Kimberley/Cranbrook. All of our branches truly exemplify that small, local steps can make an enormous difference.